Discover the simple techniques of pyrography as you stand alongside one of todays finest woodburning artists, Sue Walters. Ideal for the beginner, or for any wood burner looking to improve their skills. In addition to learning all of the basics of wood burning, you also will receive 10 detailed lessons that culminate in the completion of a stunning hawk project. 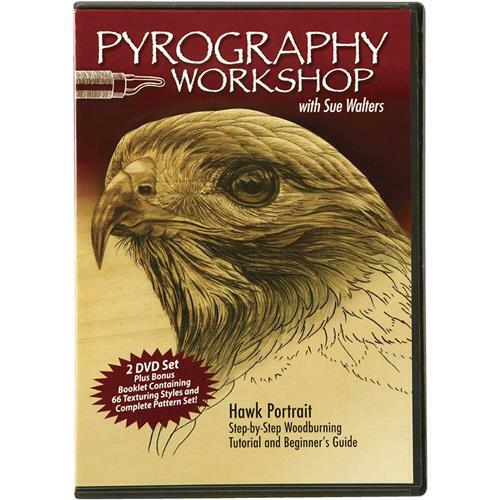 Included with the 2 DVD set is a 16 page color booklet that includes two patterns for the hawk project, a photo of the finished piece, and a set of reference photos illustrating more than 60 textures created with just four pyrography tips. 110 minutes. I haven't had an opportunity to watch it yet.